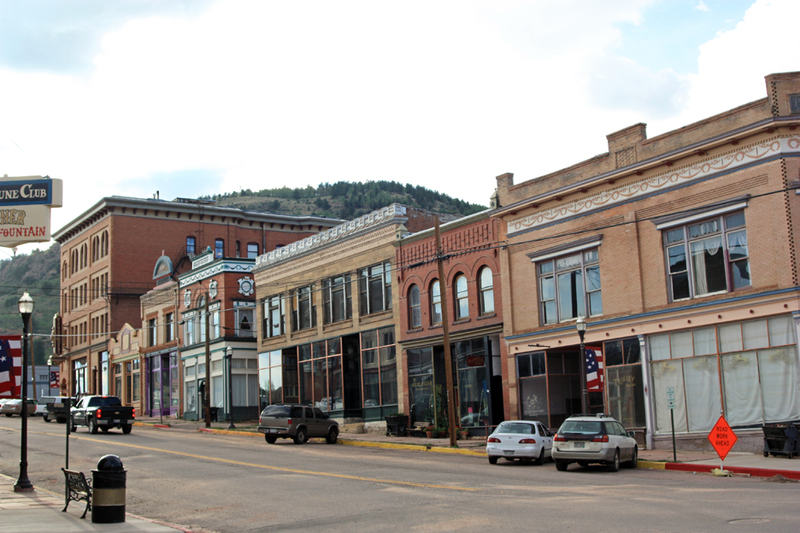 My seventh day touring mining towns in Colorado was spent in the vicinity of Goldfield and Victor in the Cripple Creek Mining District. I traveled to the American Eagles Overlook above the Cripple Creek and Victor Gold Mine and hiked on the Vindicator Valley Trail above Goldfield. Since I had arrived in camp rather late the night before, I took all of the morning to recharge my batteries, literally and figuratively. My long trip the day before which started in South Fork and traveled through Creede, Lake City, and Gunnison had used up all the spare batteries I had for all my cameras, and I was still exhausted myself. I showered in the headquarters building of the KOA and finished setting up camp, making up my tent and sleeping bag for tonight. Then I spent the rest of the morning charging up my various camera batteries and spares in the game room while reading an old Andre Norton book on my iPad. Finally in the afternoon I headed out, driving south and taking the gravel road up to the overlook. It crosses the main road used by the ore trucks taking overburden to the dump locations. 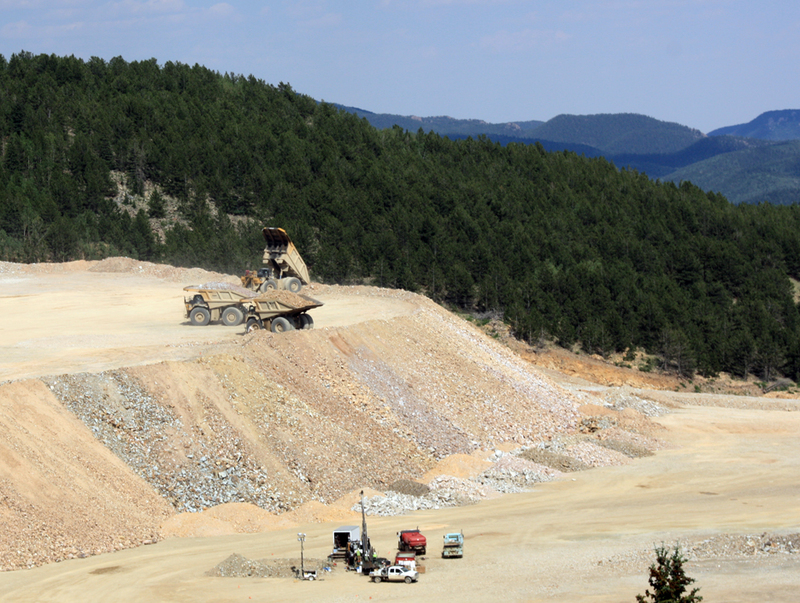 I stopped on the way to look at the open pit mine operations of the Cripple Creek and Victor Mining Company, which is a wholly-owned subsidiary of AngloGold Ashanti. They are digging a huge pit down through what was the old Cresson Mine (the same mine that discovered the huge vug back in 1914, basically a large geode the size of a room lined with 60,000 troy ounces of gold). I’ll speak more about the open-pit mine tomorrow, because I took an excellent tour of it. While observing the operation, I used a time-lapse app on my iPad to record the huge trucks driving their loads out of the pit. The American Eagles Mine was the highest mine in the district at 10,570 feet with one of the deepest shafts at 1540 feet. The land around it is a small spot of green surrounded on all sides by the CC&V operations. 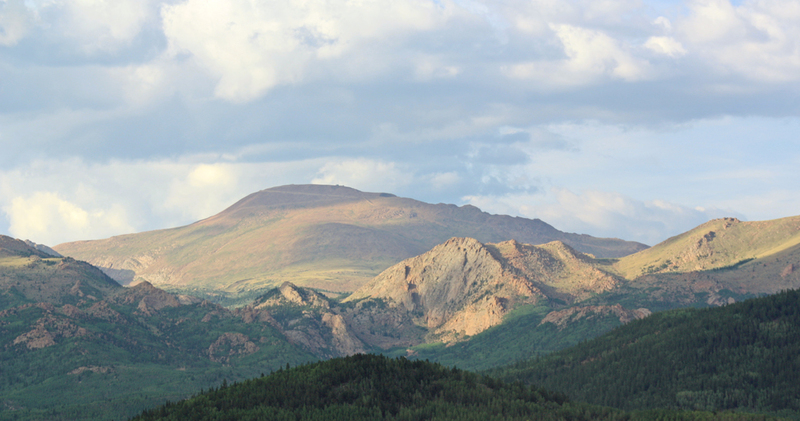 From there, one can see all the way to the Collegiate Peaks in the west and to Pike’s Peak to the northeast. Winfield Scott Stratton, whose famous Independence Mine turned him from an itinerant carpenter into the richest man in the district, bought the American Eagles Mine in 1895 as part of his consolidation of mines in the area. 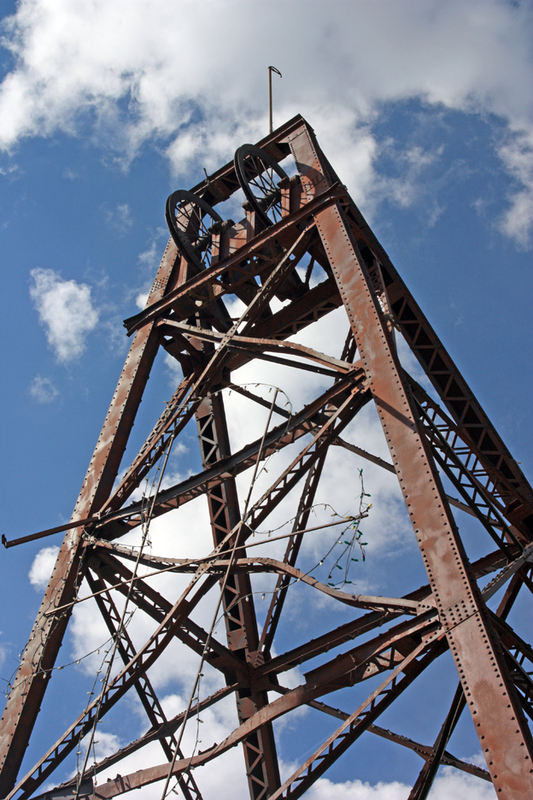 Today, the old headframe still stands with its double hoist and cage. Several out buildings, such as the shifter’s house and blacksmith shop, still stand as well. I spent a very pleasant hour at the top, reading the signs and enjoying the cool breeze. On the way back down, I stopped and hiked the Vindicator Valley trail. This area lies between the overlook and the town of Goldfield. 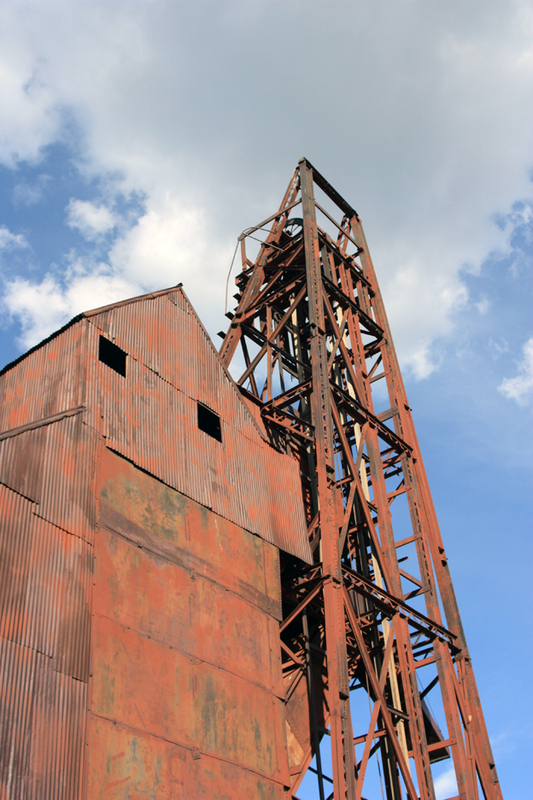 It includes the Vindicator Mine and Mill, with a large steel headframe and the decaying remains of the mill. I walked along the path, which is about 2 miles total. In places it was a bit of an uphill hike, and I should have been tired by the altitude, but I have grown acclimated and I actually felt better and more vigorous that I do at my normal 4500 feet. 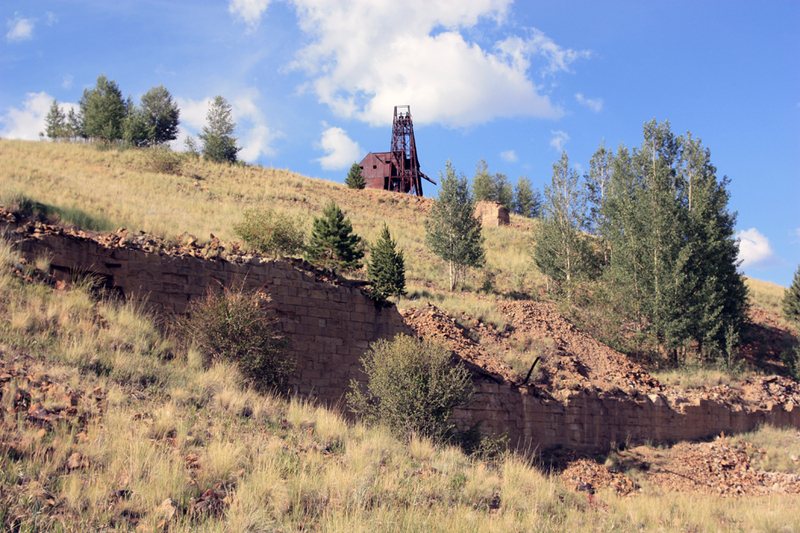 All through the valley are many remnants of mining structures, such as powder magazines, ore bins and transport systems, headframes, and mills. Some of the structures have been moved here to preserve them from the CC&V operations. 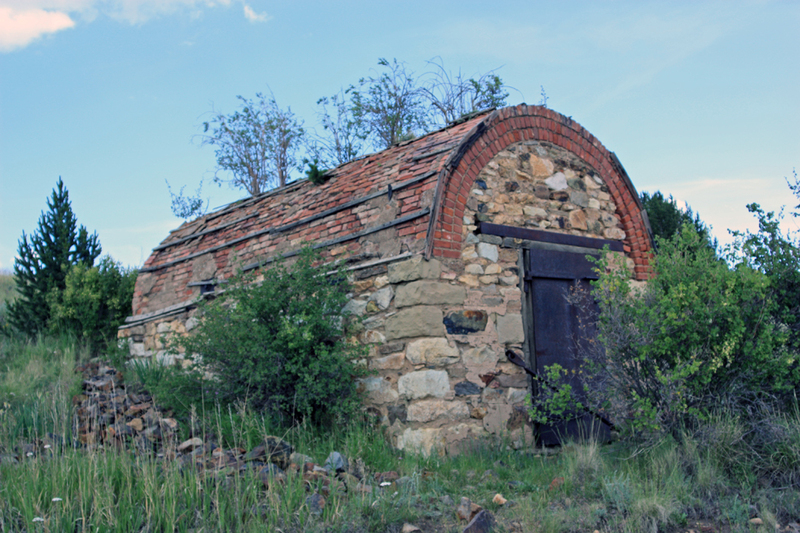 The company seems to have a real interest in preserving the history of the area, and Colorado overall does a much better job of this than Utah, where the only value seems to be to close the mines, cover the dumps, and pretend mining never happened. 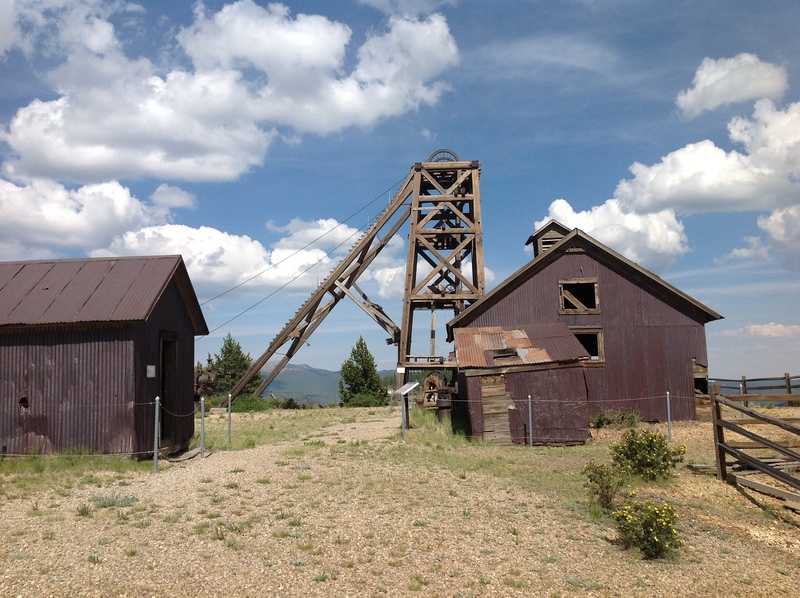 Other structures I passed included the LaBella steam powered electric plant that was at the bottom of the trail and powered the operations in the area, the Gold Knob Mine (seen as wooden cribbing toward Goldfield), and the Theresa Mine headframe. 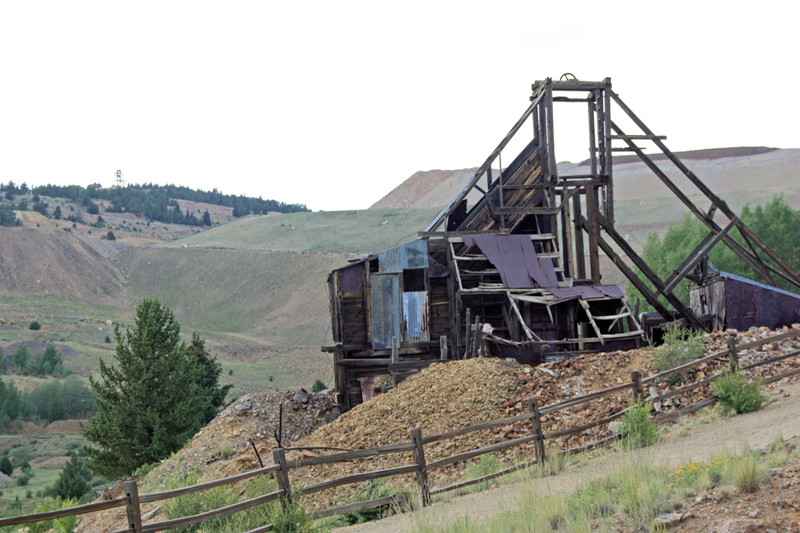 This mine was active from about 1895 through the 1950s. It was closed during World War II, as was all gold and silver mining in the country. By the time the mines reopened, so much work was needed to repair and upgrade them that most of the mines closed. 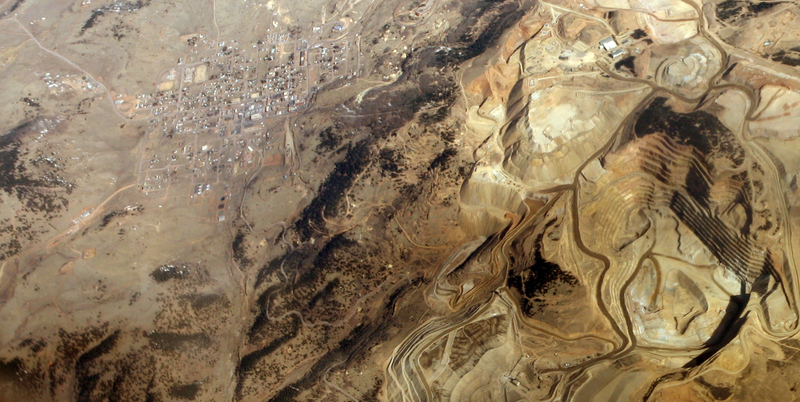 It wasn’t until the 1970s that gold operations started up again, mostly leaching of old low-grade mine waste and some small open pit operations. But in the 1990s a large-scale open pit mining operation was engineered and begun which is now the CC&V mine. As the mine has grown, so have the piles of overburden rock, seen on the upper slopes of Vindicator Valley. From photos I’ve seen of what the area around Victor looked like in the early 1900s, things have changed quite a bit. 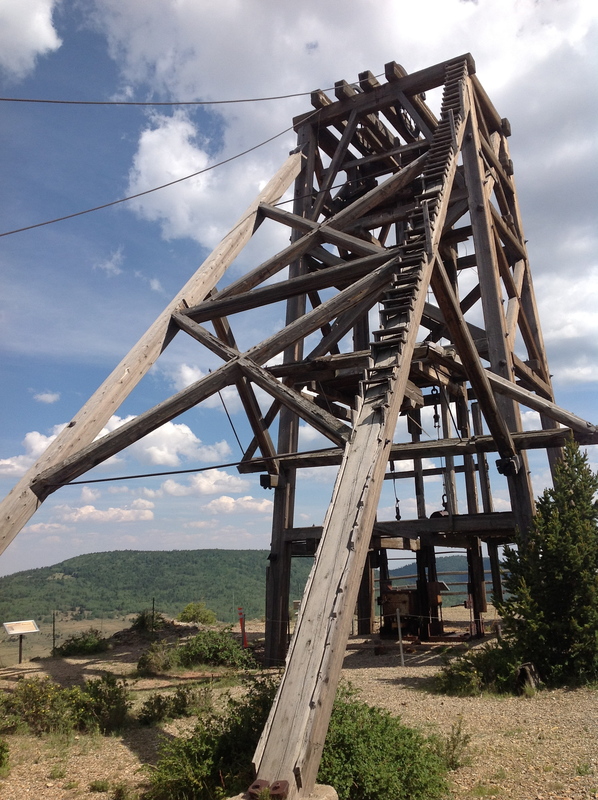 Many of these mines, such as the Theresa, were worked off and on from the 1890s through the 1950s, and many original wooden headframes were eventually replaced by steel headframes. Some structures were torn down for scrap metal, others were destroyed by time. 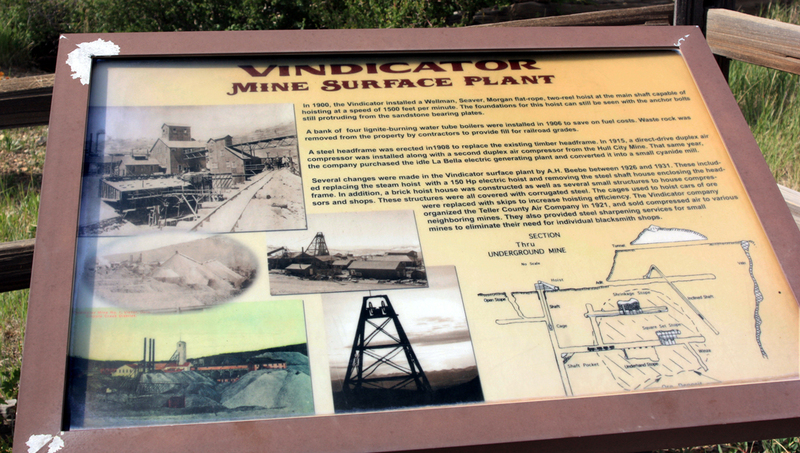 Some, such as the Lillie Mine and Mill, were bought out by other companies (such as the Vindicator Mine or the Gold Cycle Mining Group owned by David Moffat and A. E. Carlton, which bought up many of the defunct claims) and their buildings were torn down and foundations buried by waste rock. In the 1970s and 80s much of this waste rock (huge piles of it) were dug up and processed using the leach pile method to recover gold from the marginal ores. This changed the look of the valley and moderated it. The CC&V mine has done a lot to reclaim the slopes and replant native species, such as areas of pine trees growing throughout the valley. They have reinforced some of the structures and built the trail systems with interpretive signs. Anna J. Mine looking up Vindicator Valley to the American Eagles Overlook. Powder Magazine. The explosives had to be kept separately from the mines to prevent accidental destruction. After this walk I drove into Victor at sunset to try to buy a steak for supper, but the small grocery store only had hamburger. I did take some good photos of the town in nice lighting. 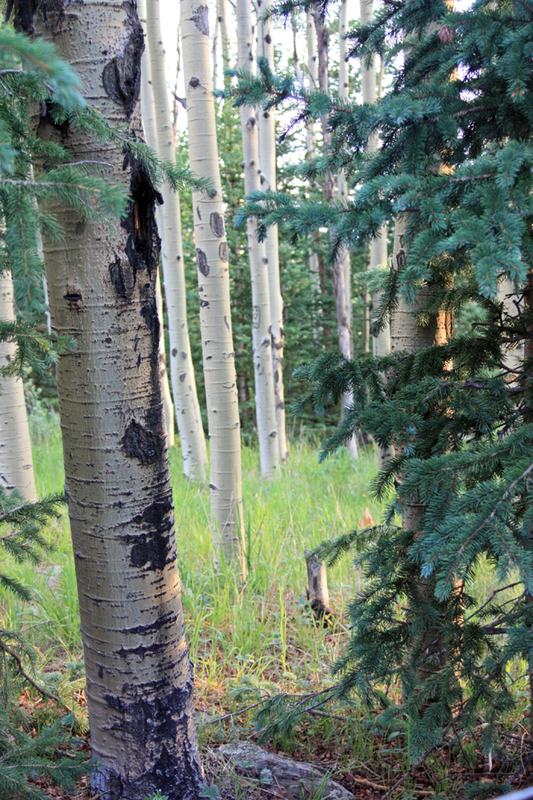 Back at camp, sunset lingered as I cooked supper and took some additional photos of the grass and aspens around camp. 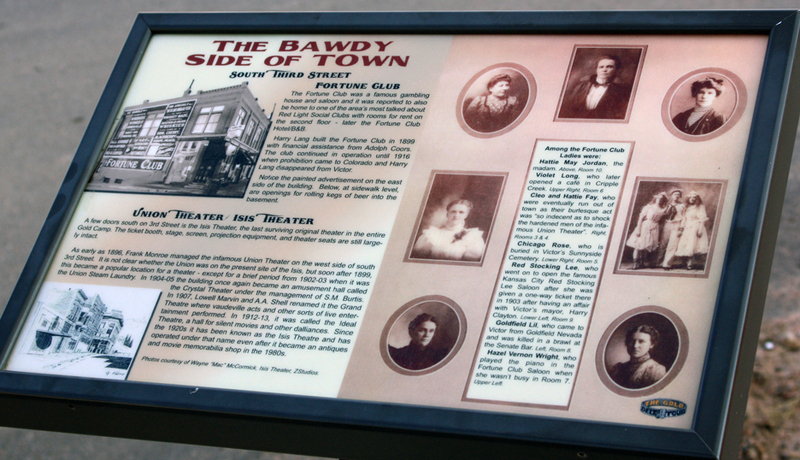 A Sign in Victor, Colorado explaining the bawdy side of town. 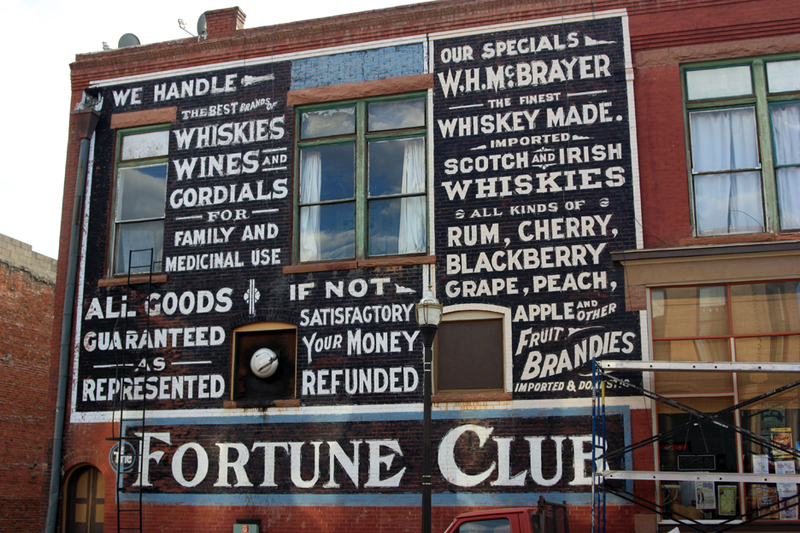 The Fortune Club in Victor, Colorado, known for its . . . er . . . entertainment. Third Street in Victor, Colorado. Aspens and Colorado Blue Spruce at my camp.